Tunnel washers were developed to save water, energy and labor and to both organize and expedite the flow of goods through the laundry. Since they entered the market in the 1960s, tunnel washers of all kinds have done this to some degree. The first tunnel washer models were bottom transfer models, meaning that the goods and the water were transferred from one stage of the washing process to the next along the bottom of the shell. But the Milnor CBW washer, introduced in 1979, took tunnel washing another step forward with the True Top Transfer technology model. A True Top Transfer machine lifts and drains the goods before transferring them over solid partitions (no seal below the water level) into the next processing stage. Additional features that set Milnor's CBW apart from other tunnels are the high ribs and double drum characteristics throughout. 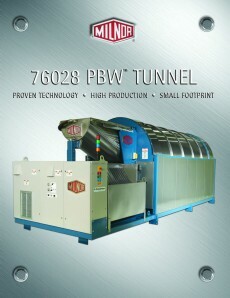 In 2010, Milnor enhanced the True Top Transfer tunnel concept with PulseFlow® technology by incorporating standing bath washing with high velocity rinsing for more effective washing and rinsing. 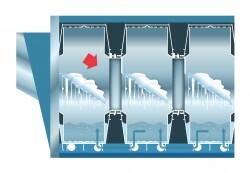 The Milnor PulseFlow tunnel washer combines a number of factors to deliver enhanced dilution and superior wash quality. The familiar catalysts in the washing process are time and temperature with chemical and mechanical action, also known as Sinner's circle or the wash pie. The concept maintains that by increasing one factor, another factor may be decreased. For example, increasing temperature may allow a decrease in mechanical action. Theoretically, as long as the wash pie is balanced, the cleaning process will take place. However, the wash pie as described is not complete on its own. For example, soiled linen can sit on a hot plate with an entire box of detergent on it, while being beaten with a hammer for an hour, and all four sections of the wash pie will be satisfied. Yet the goods will never get clean in this manner. The wash pie factors can even be adjusted, such as by increasing the temperature of the hot plate or the time it is beaten, but the goods will still remain soiled. The missing factor of the wash pie concept is the most essential element of the wash process - dilution. Water's role is to remove the suspended soil from the goods by the process of dilution. The wash pie components of time, temperature, chemical and mechanical action are simply catalytic, which enhances the role of water to remove soil from the goods. In any washing process, regardless of the washer type, each new bath results in dilution. In fact, not only are the rinse baths 'rinses,' but each bleach, suds, sour, and starch bath provides dilution with the enhancement of chemicals. A conventional washer achieves dilution by filling with water and draining, with or without chemicals. There are varying degrees of dilution in different washing machines, just as machines can also have higher degrees of mechanical action or chemical energy in the wash process. A True Top Transfer tunnel washer's better washing and rinsing quality, and thus higher productivity, results from the following three features. A tunnel washer's method of transferring goods is critical because it is the way the machine introduces each batch of goods to its next bath (dilution). And as proven, dilution is best executed if the next bath in all subsequent modules has cleaner water. Top transfer tunnel washers move linen by lifting the goods out of the water, draining the free water, and then sliding the goods into the next compartment. This process happens in one continuous movement that takes just 3.5 seconds. After the transfer, the goods are immediately exposed to cleaner water. Only the water trapped in the goods moves forward with very little free water. Milnor tunnels leave back approximately half of the total water in each compartment. In comparison, bottom transfer tunnels transfer by forcing the goods and water forward within its single shell section, along the bottom of the tunnel. Most, if not all, of the water is pushed forward into the next bath. Therefore, instead of a cleaner bath, the goods are exposed to the same dirty water that was in the previous bath while moving forward through counterflow. Additionally, goods remain in dirty water until the bath is drained and refilled in a double shell portion of a bottom transfer tunnel. True Top Transfer combines counterflow, or water moving against the direction of the goods, with the perforated top transfer scoop to achieve efficient and effective dilution. With counterflow, a tunnel washer can achieve nearly the same dilution as a washer-extractor gets with one dump and fill cycle. The difference is that while all tunnels employ reuse water, True Top Transfer tunnels utilize counterflow in each module. Additionally, the perforated top transfer scoop takes True Top Transfer tunnels a step further. The goods change baths upon each transfer. Therefore, True Top Transfer tunnels achieve approximately the equivalent of a second dump and fill and nearly twice the dilution of bottom transfer tunnels within their drain and fill chamber. Milnor's loading scoop lifts the goods, drains them, and deposits them into cleaner water. But a bottom transfer tunnel sends dirty water into the net compartment within its single shell section along with the goods. Consequently, there is no dilution as the whole compartment moves forward. Comparing total cylinder volume, Milnor gives the goods more space to move. In a bottom transfer tunnel, the first compartment provides ample cylinder space because the goods are bulkier before they are thoroughly wet down. The remaining compartments of a bottom transfer tunnel are much smaller. Generally, a bottom transfer tunnel's first compartment has a ratio of approximately 1:50, with considerably smaller remaining components as low as 1:27. In a True Top Transfer washer, each cylinder has a loading ratio of approximately 1:48. This ratio upholds the idea that the more space there is in each cylinder, the more room there is for movement of the goods. Goods can open up so that wash liquor, or the mixture of water and chemicals, can penetrate the entire load quickly. Chemicals need time to effectively clean the goods. The more space the goods have to open up, the faster the chemicals get to the full load, resulting in a more efficient process. Washer-extractors have long suds time because they are loaded to a tightly packed 1:10 ratio. Considerable time is needed so the goods can be completely and evenly saturated with the wash liquor. Goods can technically transfer to the next bath once the chemicals achieve equilibrium, where water around the goods (free water) is at the same chemical concentration as the water in the goods. Milnor's True Top Transfer tunnel washers reach this equilibrium in under 40 seconds so that less time is needed for each bath. The third reason for the True Top Transfer tunnel's enhanced dilution is higher mechanical action, resulting from excellent lift and drop during each reversal and transfer. Four factors contribute to greater turbulence inside Milnor's PulseFlow technology washing cylinder: greater volume, three high ribs that are strategically positioned, a rotational speed that uses these features to the best advantage, and high velocity rinsing. Mechanical action speeds up and enhances dilution. Water and chemicals penetrate the load faster, and soil is diluted more quickly. While some soil will gradually exit the goods with no mechanical action at all, dilution occurs faster with its assistance. Additionally, dropping goods over solid partitions adds another level of mechanical action not found in bottom transfer machines. Perforated scoops drain the goods which are then dropped into the next compartment, where they are able to open up in the spacious cylinder and absorb new wash liquid. Washing happens by dilution, aided by time, temperature, chemical and mechanical action. Milnor's True Top Transfer tunnels efficiently use water to provide maximum dilution, thus maximizing the effectiveness of washing and rinsing. 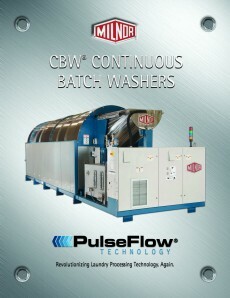 For more information on Milnor's PulseFlow technology, please call 504-467-9591.